In so many ways, our connections are often broken. We often lose touch with the wisdom of our own bodies and hearts, distracted and numbed by so many things. But connecting with inspiration, our inherent creativity, and a sense of passion in what makes us feel alive and whole is so important. Through fractured relationships and problematic social systems we lose the support, encouragement and challenge that we all need. But genuinely connecting with each other, including (and especially) those who are different from us, re-humanises us. A sustainable future doesn't just involve our physical environment, but crucially depends on our relational and interpersonal environment. Nevertheless, the sustainability of our Planet is an urgent concern. We often forget that we are part of the fabric of Nature, and often don't realise or understand the impact our actions have. On a purely individual level, re-connecting with Nature has been shown to greatly improve personal wellbeing, but developing a love and understanding for the natural world will also increase our desire to protect it. Investing in children and young people now is a way of Planting Seeds of the Future. Our core aim is therefore to create an holistic 'space' for reconnection: physically, emotionally, psychologically and spiritually. Whether strengthening families, hosting celebration and discussion, encouraging art, music, and creative expression, or building and facilitating community resilience, there is a great need for us all to re-connect. As children are unwitting participants in life, and constitute the future of the planet and its life-forms, we believe that every child should receive the best care, the best recreation, the best education, the best art, culture and environment and the best learning opportunities to enable them to grow into secure, mature adults. Our culture does not seem to have the best interests of children at heart, frequently placing other considerations above their well-being. The adult world seems to be in denial about the violence and destructive power of the social structures it upholds, due to the self-centred, consumerist, narcissistic, and adolescent way our culture is structured and enacted. Economic and ecological crises continue to worsen and the future of children is being neglected. Despite having the benefit of past experience and much inherited wisdom at its disposal that might help to transform this structural violence towards children and the planet, our social system results in increasing numbers of children who have mental health problems, practice self harm, commit or attempt suicide, have behavioural problems, are antisocial, and manifest violent, disruptive, or criminal behaviour. Many are simply very unhappy, with a deep need for quality time and relationship with their families and friends; the right conditions to learn and develop; more respect and better self-esteem; and safe environments and opportunities to take part in positive activities that help them thrive. To defend and nurture the innocence and wonder of children. To change the story about children (the way they feel about themselves, the suspicion with which young people are often regarded by adults and what is required of them) and to create a new story: where adults accept responsibility for who children are becoming (and have become) in the world being created or destroyed for them. To increase understanding of the world and needs of children and young people. To lobby for change where children are suffering and to resist unsustainable growth culture. To enable children to receive experiences which help them grow, mature and become world-centric (rather than egocentric) so they will be able to help transform our toxic culture into a healthy society which is sustainable, just and compassionate. To encourage mature embodied creativity through wonder, discovery and the knowledge of nature and of human culture, and to explore the relationship between the two. To foster and nurture the spirit of the child in children, their parents, carers and teachers. To increase training and knowledge about positive, transformative education and parenting, and care for those whose family life is disrupted by providing developmental work for people at all stages of life. To mentor and initiate adolescents into the self discovery required for eco-literacy. To mentor adults in their developmental work as they seek to join the new story. To help maintain the balance between the human and other-than-human communities. 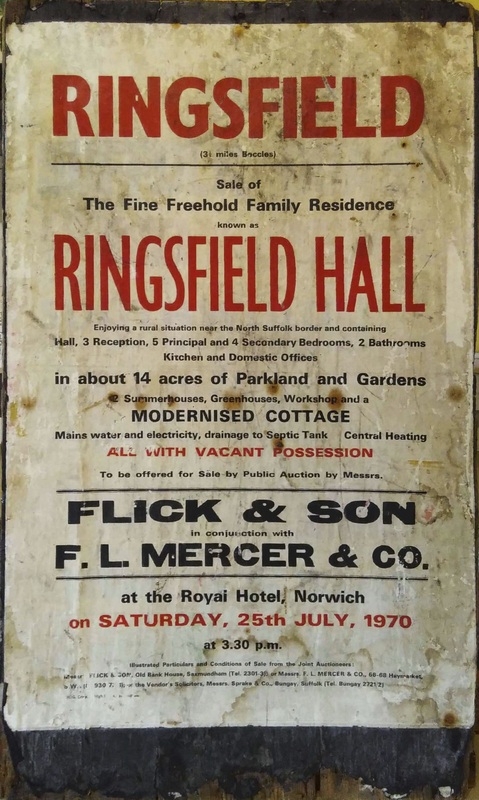 Ringsfield Hall EcoActivity Centre is governed by Ringsfield Hall Trust, a registered UK charity (no. 1093404) and charitable company (4222560). In 1971, the Hall and grounds were bought by Peter and Sally Langford, who had been teaching in the East End of London. They had a vision for a place of retreat for children - a place to play, learn and 'be'. The Trust was founded on Christian principles and in the 'peace and justice' tradition, and for 10 years there was an intentional community based here, looking to serve the wider community whilst hosting scores of school residentials. In 2001 the whole estate was gifted in full to the Trust. A long line of Centre Directors have continued and built on their original heart and spirit, and much of it remains today in offering a fully inclusive resource and creative 'space' for the whole community, especially thousands of school children every year. Our core aim is 'reconnection': with ourselves, with others, and the planet we're a part of. Our core focus is on children, young people and families.